The indigenous development of a new class of submarine, known as MiLDEN (Milli Denizalti - National Submarine), is an ambitious attempt of the Turkish defense industry to design and develop a new class of submarine. This includes developing the suite of electronics, telecommunications, sensors, propulsion and weapon systems that will be integrated into the boat. The MiLDEN program began in March 2012 under the auspices of ArMerKom, the Turkish Naval Research Center Command. The first phase of the program, which lasted until 2015, included the feasibility study. In accordance with the Strategic Plan for the 2012-2016 period of the Turkish Ministry of Defense (SSM) as it was published in the autumn of 2013, the first phase of the MILDEN program, which includes carrying out the feasibility study, which would be completed by 2015. The second phase – initiated in 2015 – proceeded until 2018 and included the definition of the submarine’s technical and operational specifications. During this period, the Turkish defense industry developed the national integrated submarine management system, the national sonar, the national torpedo, and all related systems. Under the leadership of Undersecretariat for Defense Industry, STM is carrying out studies in this direction. At the end of these works, the first concept submarine (x-TS1700) was designed and a 1,700-ton submarine was designed. The Type 2014TN air-independent drive (AIP) is aimed to be produced by the experience gained in the production of submarine, with the emphasis on domestic resource and industry capabilities. Preliminary design work on submarine settlement was made, followed by analysis and calculations. The STM x-TS1700 will have a wide range of missions such as submarine, ASW, ASUW, land attack, intelligence, exploration and surveillance (ISR) and special operations. Navy Command issued an information note on 15 June 2017, on the first national submarine of the Republic of Turkey to build with local opportunities. The national submarine Workshop was held June 15-16 date in the Istanbul Pendik, Istanbul Naval Shipyard Design Project Office Manager. nformation note; To inform the national companies to ensure that the systems mentioned by the characteristics of the platforms and combat systems that MILDEN should possess in the context of the Naval Forces Command needs to be produced domestically at the maximum level and to inform the national companies about the competencies and competencies they can give in design and production, areas and national production of vulnerability areas were determined to be determined. Admiral Bülent Bostanoglu, Commander of the Naval Forces, said in his speech at the MILDEN Workshop: "The fact that our Naval Forces, which have a structure that can pass on their own designs in accordance with their operational needs, can realize much more ambitious and big projects with the support of the Undersecretary of Defense Industry. The Turkish Defense Industry has been in position to export the combat ship in the 51st year of the adventure that started with the construction of Koçhisar Karakol Gem in 1966." It should be noted that MILDEN is a much more difficult project in terms of engineering, technological and political aspects than MILGEM or TF-2000. In addition to a strong state willing to overcome these difficulties, the most important of the major units that must work intensively on the project are; It is an absolute necessity for the Turkish Naval Forces, Istanbul Technical University , Domestic Industrial Organizations and the SSM, which is responsible for their co-operation, to act with great devotion and full compliance with the national interests. If such a harmonization can not be achieved, or if it is not desired, it will not be possible for the project to actually succeed. In the period 2017-2023, a Turkish company would develop a national Atmosphere Independent Power (AIP) system. Along with the design and preparation of the Turkish submarine, the domestic industry will continue to develop subsystems that will be tested in three old Turkish submarines ATILAY. According to Turkish Admiral Bulent Bostanoglu this process will be carried out in five stages and the last will be the construction of the new submarine. The first phase of the development and testing of subsystems to be installed in the new submarine will run from 2014-2017 and will include the development and testing of a subset of Turkish submarine design and construction subsystems in the S-347 ATILAY submarine Type 209/1200. In particular, the submarine to be used as a test boat will be installed and tested national snorkel, national periscope, national submarine electronics, national software, national integrated Combat Management System, national Akya torpedo and national underwater launcher anti-rocket rocket Atmaca. The second phase, which will also last three years from 2017-2020. In this phase, the S-348 Saldiray submarine Type 209/1200 will be used, which was withdrawn from active activity in November 2014. At this stage the Turkish industry will work with the German company HDW to acquire AIP propulsion technology. The third phase of the program, which will also last three years (2020-2023), includes the development of the national AIP propulsion system. The Turkish AIP propulsion system will be tested on the S-349 BATIRAY submarine Type 209/1200. The third phase of MiLDEN includes a two-year initial design period (2023-2025) to design the hull and installation of the AIP system. This would be followed by a three-year detailed design period (2025-2028) to include the installation and integration of the systems mentioned earlier. The construction of the first submarine will start in 2028 and the goal is for it to be delivered to the Turkish Navy in 2033. The Navy intends to incorporate as many Turkish defence companies into MiLDEN as possible. The final stage of the MILDEN program includes the construction of the National Submarine and will last for 4 years (2028-2033). 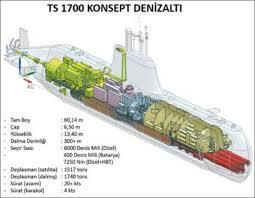 It is estimated that the domestically designed Turkish submarine will have a displacement of 2,400 tons, be 70 meters long, and will be technologically based on the German submarine Type 214TN. It is estimated that eight submarines will be built with a budget of $ 4.4 billion. It is possible to foresee that the first ship of the MILDEN design can enter service in the period of 2030-2035. In this case it can be understood that this submarine is considered to serve roughly in the period of 2035-2070. Being able to understand this time frame is extremely important in that the design concept of a new generation submarine can be formed correctly. Can Turkey design and produce a nuclear propulsion system for a submarine at their own expense?